The session ran from 0800-1500, followed by a 45 minute session with the lure rod before heading home. 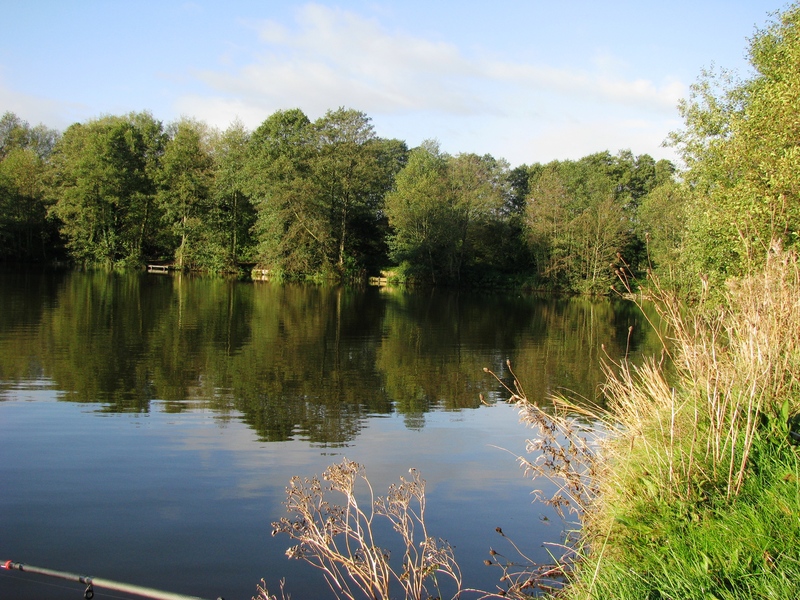 Anyway, the same pool as I fished on the previous session but from a different peg – almost opposite the one fished on the last visit. Again I Spombed (c) out several loads of dead maggots on arrival and topped up occasionally with further Spomb loads over the day. 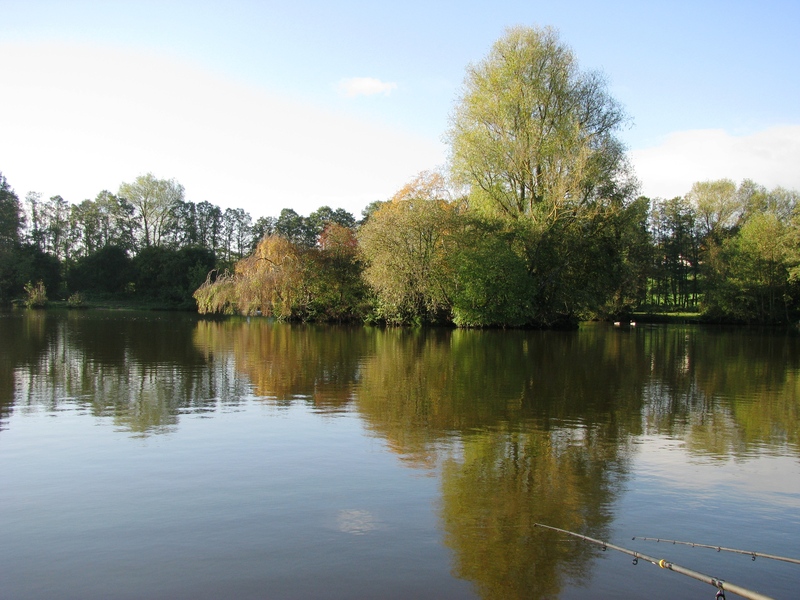 Tackle consisted of the usual two 1.75lb TC Avon rods, both fitted with 8lb main line, 8lb braid hooklengths and legered with 1/4oz Arseley bombs on 3″ sliding links. One rod had a size 12 barbless hook baited with maggot, the other a size 6 barbless used with bread and meat baits. 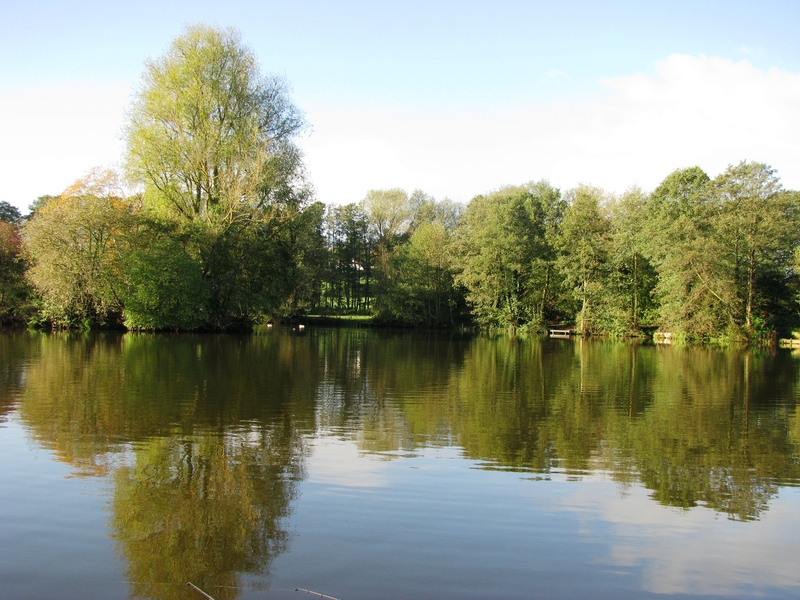 Action was steady throughout the day, if not hectic as it seemed it may have been – as first cast with the bread rod and 30 seconds later, whilst still prepping the second rod, the indicator flew up and the beeper beeped – and a 2lb 1oz common carp was soon netted. After that things calmed a little but bites were steady throughout the day bar that many were not as bold as this first fish and simply gave slight lift and dropbacks of 1″-6″. I did have one hectic moment though as a fish on the bread baited rod was being landed, the buzzer on the maggot rod went off… struck into the fish and replaced the rod on the rests whilst I landed the first fish, unhooked it quickly within the landing net, checked that the fish was still on the other rod which it was and so so landed that fish alongside the landing net’s original occupant. At 1500 I packed up the carp tackle for the day, loaded up the barrow ready to leave and then set up my lure rod – an easy task as I carry all my rods pre-tackled in a quiver type holdall and so I needed only to push the two rod halves together of the 8′ 6″ Mitchell Firebird rod and clip on my chosen lure (a 13cm Savage Gear Soft 4Play ‘Fungus Roach in a green scull lip) onto the snaplink of the wire trace at the end of my 30lb braid mainline and I was ready to start. Anyway, I fished the 5 swims from my original swim back to the car and although nothing was attracted from the first four, but at the fifth, a nice corner peg with a scaffold stage and an apple tree overhanging a small reed bordered bay there was a follow and lunge from a pike but the lure was missed and despite casting over the area from several different angles and running the lure by several different styles (jigging, sink and draw, slow and steady, etc) I was unable to elicit further interest and finally decided to call it a day and left the water at around 1615. Get Knotted!! Or More On Making Hook Lengths…..
As I’ve previously said elsewhere in this blog, I’ve decided that braid useage in hooklengths does not need to be more than a maximum of 6″ long. But braid is not a great material for loops that are intended to fit over quick-change beads or links on swivels as once wet the braid tends to cling together and trying to open out the loop with wet, and sometimes cold fingers, can be a trial of patience and dexterity. 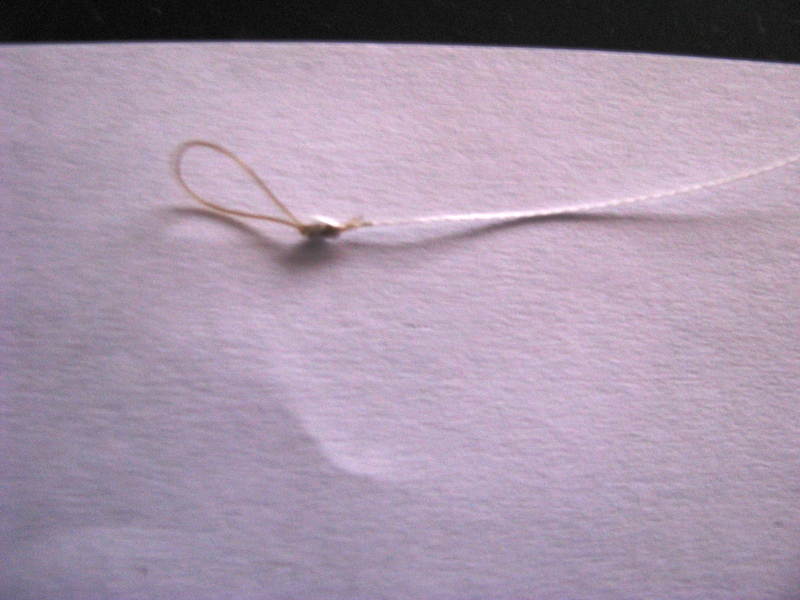 And so to rectify this I described using a dual material hooklength – the bottom part (< 6″) to the hook being braid and the upper part to the loop for connection to the mainline being standard monofilament which does not have this tendency to cling and with its natural springiness it provides an easy means to place on your bead or swivel. The two parts being connected with a ‘shridd knot’ as described in my Sept 12th 2013 posting under the title “A Page Of Thoughts And Other Meanderings….” And this works well from my experience…. HOWEVER – I have discovered one case where this dual material creation as it stands does not work so well – and this is when using the technique known as ‘laying-on’ – basically using a float fished overdepth and overshotted (use Google for full details of the method) – when the distance of the lowest shot from the hook can be literally 1″ or less – although more usually 3″-4″ – AND if you wish to thread you bait onto the hook length with a baiting needle – as I do when worm fishing – I use a baiting needle and pull the hooklength through the entire worm’s body from about 1/4″ from the tail to a 1/4″ from the head. OK? See the problem? That bottom shot resting a few inches from the hook? To thread the bait down to the hook on a standard length hooklink (12″) you’d need, each time you re-baited, to remove all shot from the hooklength – hopefully only that bottom one but possibly more depending on your shot arrangement. Personally I have all my bulk shot around mid-depth with just the one shot on bottom but occasionally I do need to add an additional adjusting shot to counteract water drag and hold the bait still on the bottom. WHAT A PAIN if you had to do that all the time. Partial solution – very short hooklength – so that the bottom shot is sited ABOVE the connecting item (bead/link) – ie is 6″ or less. Easiest is just a 100% braid hooklength – but then that clingy loop becomes a problem again. But to add a length of monofilament means messing with 2″/3″ lengths of material to connect together/make a connecting look/to tie on the hook… fiddly at the least, impossible at the worst. 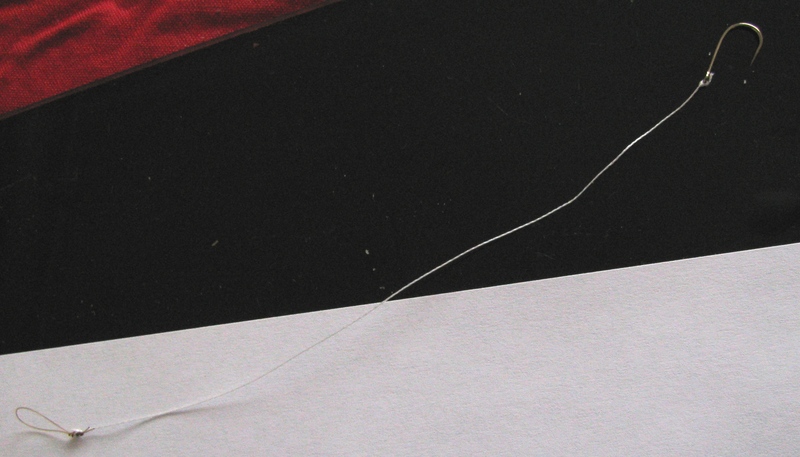 Solution – hooklength is braid BUT the loop is monofilament – and ONLY the loop. 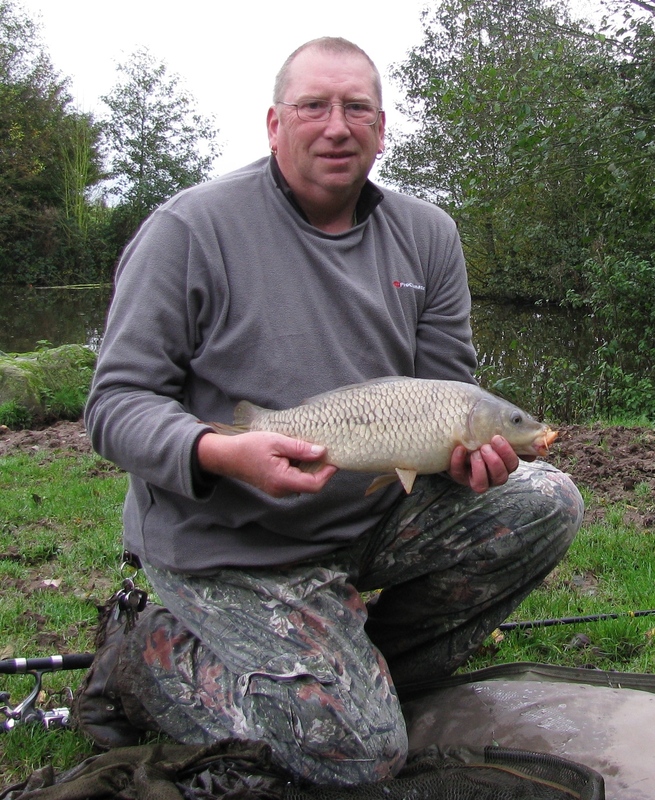 And its relatively easy to do – if you have a Preston type hook tyer…. (also under other names)… but make sure its this TYPE, another type has a body with just 2 pins sticking out that require you to actually tie the knot yourself and the pins act just as a size former. 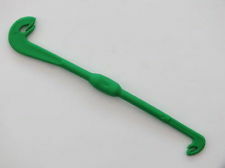 £1 off eBay, various other prices elsewhere – and this one ties loops of 2 sizes. Basically the modus operandi of the device normally is shown here: http://www.youtube.com/watch?v=BXJM2xMhSxk…. And to make the mono looped braid hooklength it is just a matter of following these instructions using your intended monofilament for the loop… but AFTER having made the initial loop around your finger, you lie and hold your braid alongside the mono so that the end of the braid reaches the end of the mono loop…. and then just follow the rest of the procedure using both the braid and mono together as if they were a single unit. Then having completed the process you will have a knotted mono loop from which issues 4 lengths of material – the 2 long source/spooled lengths of mono and braid, and the 2 short ‘tag’ ends of both…. and to complete all you have to do now is to cut/trim off, close to the loop, the long mono length and both tag ends leaving you with a mono loop fitted to your braid – and so now just cut the braid slightly longer than your required hooklength to allow for tying on the hook – I generally cut at about 6″-7″ – and then attach hook at required length and trim per usual. Ok… so in use for laying-on the mainline is fitted with a quick-release bead or simply a small link swivel, above which the shot that lies on the bottom is placed, and the hooklink is just removed/baited/replaced to the bead/swivel with the minimum of fuss. In fact, I’m switching all my hooklengths over to this short braid-with-mono-loop system – actual length of hook to lead/shot being determined by shot or by leger stop placement on the main line. With such short braid lengths they’re dead easy to store as the loose ends do not generally need to be tethered, can store more too as no need to have several different lengths, plus less prone to tangle (both in storage and in use). 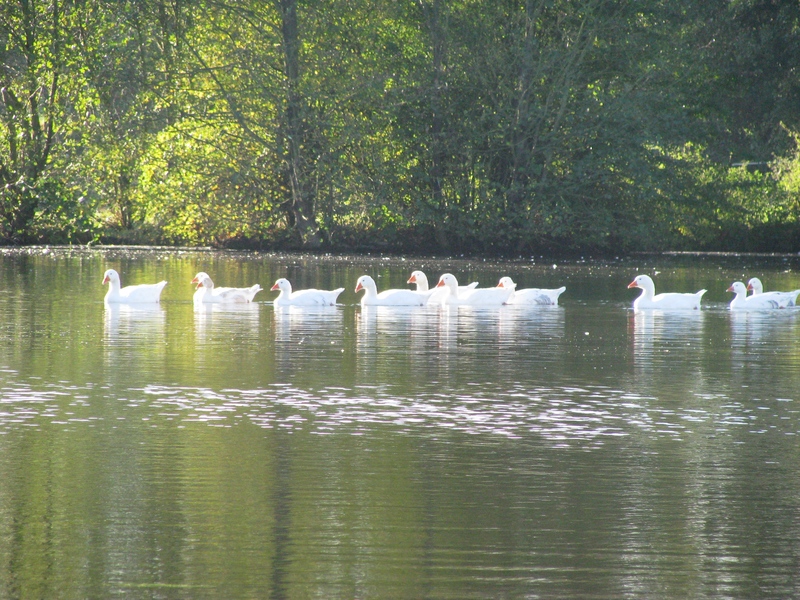 Session 57 – Carping On…. 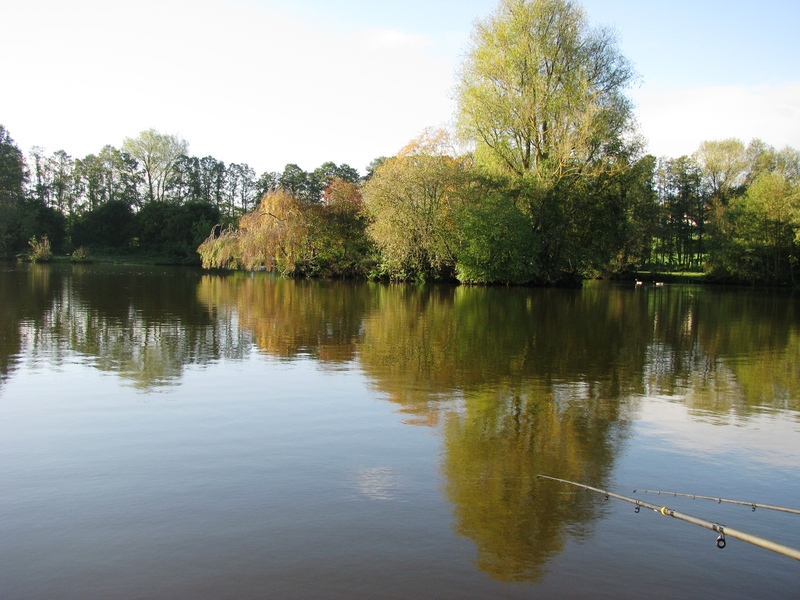 Friday 1st November 2013 found me heading to the waterside of one of the club’s mainly carp pools in Staffordshire (GH) arriving at my chosen peg for the day (18) at around 0800-0815, the peg being chosen for 2 reasons (a) I like the peg and is one of my main two selections whenever I go there and (2) it faces north and with the forecast for the day of light->heavy rain and winds from the south it seemed reasonable to place the brolly in its optimum location to shelter – and also the back of the swim is lined with bushes adding further wind protection. However, it was in general quite a nice day – mild and generally very calm but with a few (< 5 min) light showers until 1500 when the heavy rain started – and I packed up and left at this stage as the rain was forecast to continue into the evening. So, the brolly was set up and tackle prep completed and several large Spombs (c) of dead maggots were sent out to bait up the swim, and lines went into the water at 0845. Fished 2 rods on the pod – both 11′ Grandeslam 1.75lb TC Avons fitted with 8lb line with 6″ 8lb braid hooklengths. One rod had a size 6 hook and was baited with bread, the other a size 12 baited with 6-8 maggots. 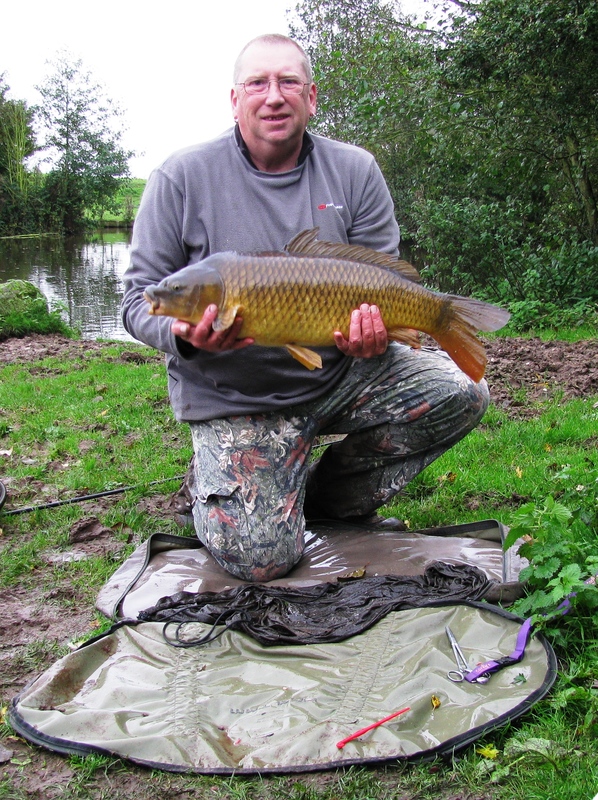 At 0920 the first fish of the day was landed, a 4lb common carp, taken on the maggot rod. The thoughout the day a number of fish were taken – common carp and bream – and also a couple lost including a very large – it would almost certainly have been a new PB for me – common carp which I had played for 10-15 minutes and which was almost ready for the net when the braid hooklength snapped – devastating!! 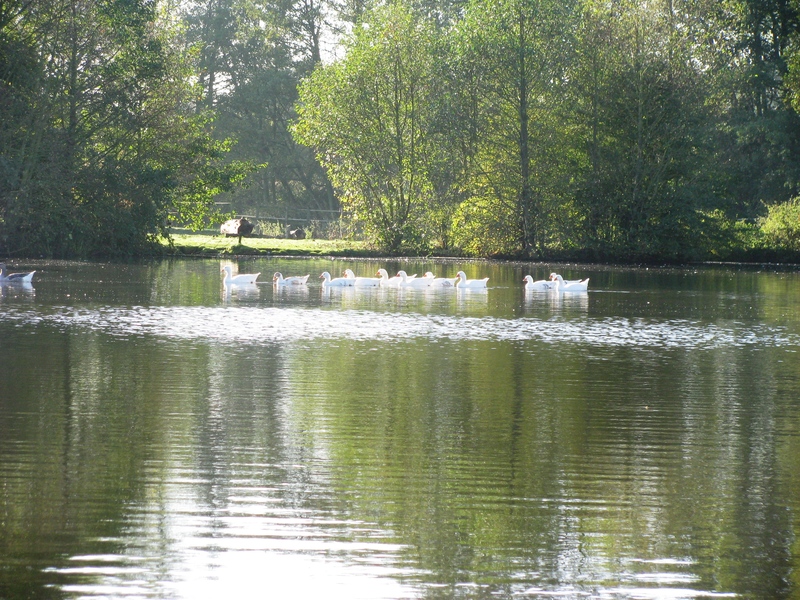 At around midday, due to carp activity on the surface, I took off the lead from the bread rod and tried floating bread. I had 3 takes over a couple of hours, 2 of which I missed and 1 landed. As I said, I packed up at 1510 – the BBC Weather forecasters having got it spot on with ‘heavy rain at 3pm’ … 1445 was fine and I was thinking of staying until 1600 but at 1501 the skies darkened and the rain built up leading me to pack up at 1510. By the time I got to the car I was drowned – and arrival home to a hot bath and hot choc was *WONDERFUL*!